French or Italian bread sliced thin and toasted in the oven. Core each tomato to remove area that attached to the stem. Score the bottom of the tomato with an X pattern. Bring a large pot of water to a rolling simmer. When you begin to see the water boil, add tomatoes and cook for 1 minute. Have a bowl of cold ice water standing by. Using a slotted spoon, remove tomatoes from hot water and place directly into cold water. Cool for about 3 minutes in water. Remove the tomatoes from the cold water and you will be able to pull the skin off with no problem. Next cut the tomatoes in half and remove all the insides leaving just the meaty part of the tomato. Cut into bite size pieces. Mix in remaining ingredients and allow to sit for about 10 minutes to allow all the ingredients to come together. Top toast with tomato marinade and eat! 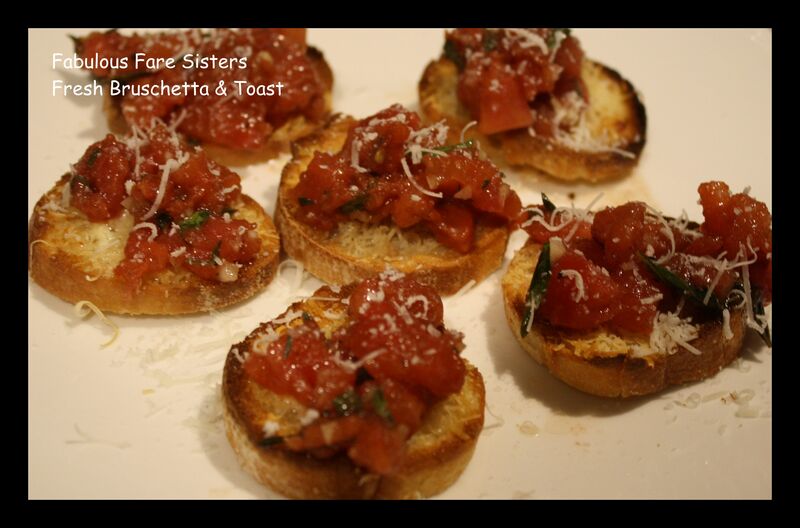 Fresh Delicious Bruschetta! Healthy and delicious! I use it on fish, eggs and chicken.